BlogHome » How Many Laser Tattoo Removal Treatments will I Need? There are a number of factors that influence how many tattoo removal treatments you will need, most of these are out of our control. 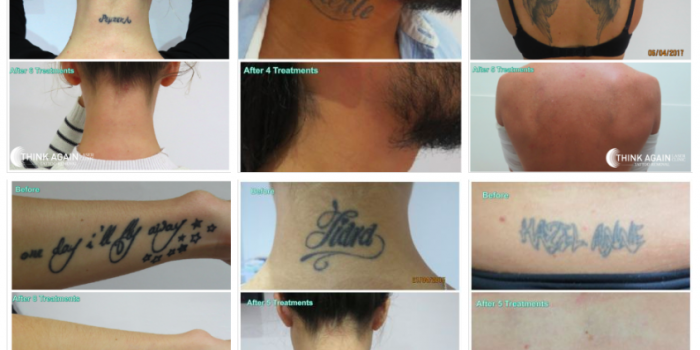 At Think Again Laser Clinic, we never make promises that we can’t keep, however what we can promise is – that you will be treated with the most advanced technology and by Sydney’s most experienced Laser Tattoo Removal Specialists. While most of our clients will need between 4-10 treatments to completely remove their unwanted tattoos, it is important to know that we cannot predict the outcome nor will every tattoo fit into that range. Did you just get a tattoo and already regret it? One of the most significant factors that will influence the number of treatments that you will need, is the age of your tattoo. There is a misconception that brand new tattoos are very easy to remove – however that unfortunately is not the case. Our bodies are built to instinctively remove tattoo pigment, our immune system detects the ink as a foreign matter and as a result, works to remove as much as it can. 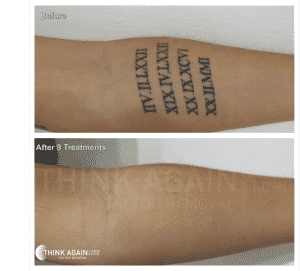 When comparing a 20-year-old tattoo and a ‘new’ tattoo, the 20 year old tattoo will be very faded prior to starting laser treatments, have changed in colour and may even appear to be ‘blurry’, as the body has worked over 20 years to remove the ink. Whereas a new tattoo will have 100% of the ink sitting in the dermis. There is no harm in starting treatments on a new tattoo however, we recommend that our clients wait at least 2-4 weeks before they begin treatment on their new tattoos, to ensure that the tattoo is completely healed and the skin is fit for laser treatments. My tattoo is only small – it won’t take many sessions to remove! This is one of the most common statements that we get when clients enquire about tattoo removal. Unfortunately, size plays absolutely no part in the amount of sessions you will need, while it may sound confusing – the size only determines the amount of time that you will spend sitting in the tattoo removal chair. A whole sleeve can be removed in the same amount of sessions as a tiny letter, it all depends on the amount of ink that the artist has injected into the skin. Why is my wrist tattoo taking so many sessions to disappear!? The location on your body is one of the most dominant factors for tattoo removal. Blood flow and White Blood Cells are the vessel that your body uses to carry the ink particles around and out of your body. The closer your tattoo is to your heart (where the blood pumps from) the easier it is for your body to send cells to the area and carry the ink away. Chest, rib, upper arm and neck tattoos will always fade faster than ankle, finger and wrist tattoos as the blood flow is more consistent in those locations. Black vs coloured tattoo ink. The colour of a tattoo will play a big part in the number of laser sessions you will need. Black ink is the fastest and easiest pigment to treat and remove. 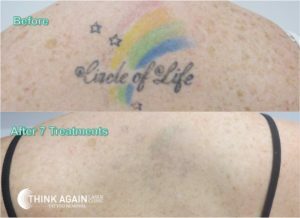 Coloured tattoos require a different treatment approach and rely on a laser with multiple wavelengths. Red, orange, yellow and some pinks are slightly more complicated than black ink, followed by purples, blues and greens. Blue and green ink in particular requires many more treatments than any other colour as it is the furthest colour from black and is very different to our skin tone. Manufacturers of tattoo inks are not required to reveal the contents, Tattoo inks may be made from titanium dioxide, lead, chromium, nickel, iron oxides, ash, carbon black, and other ingredients. Among the most popular pigments are those made from acrylonitrile butadiene styrene (ABS), a type of heat-resistant plastic that is used to make luggage, pipe fittings, appliance parts, and, when ground down, tattoo inks. These inks are popular because they produce vivid colours. Our bodies struggle to break down many of these ingredients, which as a result requires many laser removal sessions to be completely removed. All skin tones can be treated with laser tattoo removal; however, each client’s treatment process will have to be tailored exclusively to their individual skin tone. Darker skin contains more pigment (melanin), so care must be taken by the laser specialist when choosing the power settings, to ensure that the laser does not mistake the skin pigment for ink, which may result in pigmentation issues and skin colour loss. Our clients can have peace of mind at Think Again Laser Clinic that they are in safe hands with our knowledgeable Laser Specialists. Does your tattoo look very dark or raised? The amount of ink that the Tattoo Artist has injected into the skin will influence the number of sessions required to remove it. The more ink that is in the skin – the harder your immune system has to work to break it down. For example – many clients go back to their Artist to get a ‘touch-up’, which creates double the amount of ink in the skin, therefore the number of Laser Tattoo Removal sessions will increase. It is very common for tattoo artists to ‘over-fill’ the skin with ink, we see this commonly with linework tattoos or writing, artists who work like this, produce risen, scar-like tattoos and your body will have to work extremely hard to remove the amount of ink that is in your tattoo. The ingredients in the ink that the artist uses can make it hard to predict how many treatments a tattoo will need. Tattoo inks can include ingredients such as Chrome, Lead, Aluminium, carbon, zinc and many others. As we don’t know what ingredients have made up the ink that is used they may be stubborn for your body to break down. Looking after yourself helps your tattoo removal. Another factor that is often over-looked is your personal lifestyle. As we are using the immune system and blood flow to remove the ink in your tattoo, the more you look after your body and give it the fuel and exercise it needs, the easier it will be to remove your tattoo. Clients that struggle to drink the minimum amount of recommended water each day will find that their tattoos hang on for much longer than our clients who are healthier and more hydrated. We aren’t telling you to run a marathon or drastically change your diet, but small changes such as taking vitamins, exercising more and quitting smoking will be nothing but beneficial for your tattoo removal treatments and post-care. Have you been treated before? If you have been treated for laser tattoo removal prior to visiting our clinic you will need to be aware of the possible complications concerning your removal. Unfortunately not all tattoo removal lasers being used on the market are safe or effective for tattoo removal. With this in mind, not all laser operators are experienced in how to achieve a complete removal safely and effectively. We have seen the damage that many other Sydney clinics have caused and unfortunately for our clients once their is any damage in your skin, providing a complete removal of your tattoo becomes far more difficult if not impossible. It is important to make the right choice from the start ensuring you are confident the clinic you choose can provide a complete removal for you. We have many clients who have been treated elsewhere before coming to Think Again and unfortunately they present their skin to us that has visual damage (pigmentation or scarring). 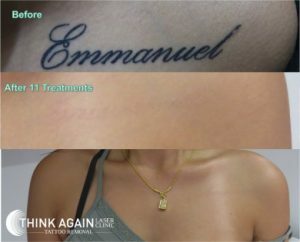 At Think Again Laser Clinic we are constantly developing our treatment plans to ensure our clients are getting the most out of their tattoo removal sessions. Unfortunately, there are no guarantees in Tattoo Removal as tattoos are meant to be permanent and as a result, some can be more stubborn to remove. 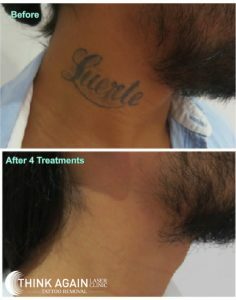 While we are unable to predict the exact number of sessions you will need, our Laser Specialists will make an educated estimate based on their professional opinion and previous treatments, taking into consideration all of the factors such as location, age, colour, lifestyle, skin tone, previous treatments – a specialist will be able to provide you with an expectation for your individual tattoo during your consultation.